Twenty-odd years later, we’re about to see another “flow” of transformation thanks to resurgent interest in artificial intelligence and the emergence of the AI-powered business application. What’s different this time around is the transformation will be driven bottom up by rank-and-file employees, making it potentially more disruptive than any “flow” of process change that came before. What are AI-powered apps, and what do they have to do with business process re-engineering? AI-powered apps are software capable of performing higher-order tasks associated with the work of educated office workers. With narrowly focused “brains” optimized to perform a particular task within a narrow domain, AI-powered apps can schedule your business meetings, answer common customer requests and notify you that your connecting flight is delayed by 20 minutes when you thought you had 5 minutes to sprint to the gate. Outside the purview of IT, employees, teams and entire departments will champion process re-engineering efforts with AI-powered apps, whether they realize it or not. As each individual app eliminates a “task,” the employees who assemble their own “stack” of AI-powered apps will automate many of the mundane parts of their jobs. Teammates eager to be productive and stay competitive will fast follow, as will department managers who want to demonstrate techno-prowess and cost-cutting efforts to higher-ups. We define AI-powered business applications as software in which the user experience is driven by AI. Today, that takes the form of voice (Apple Siri), text-based interfaces (x.ai’s Amy) or intelligent notifications (Google Now). Other examples of AI-driven UX like Google Search’s autofill differ in that they do not automate a step within a workflow. Excluded are new-school applications for fraud management, data science or security analytics that leverage AI solely for back-end ops and/or require technical/IT admin chops to operate. We include developer services because they will enable the next wave of AI-powered business apps. In the chart, we’ve included current as well as soon-to-be entrants according to our understanding of those companies’ product roadmaps. This landscape is intended to serve as a complement to Shivon Zilis’s birds-eye view of AI startups. We welcome you to critique it in the comments sections of this post. New Categories Will Emerge Over The Next Couple Of Years. In our initial sweep of the startup landscape, we’ve identified 10 app categories getting the AI treatment. This is just the tipping point. Startup activity will accelerate rapidly over the next two years as entrepreneurs identify new business processes to automate. 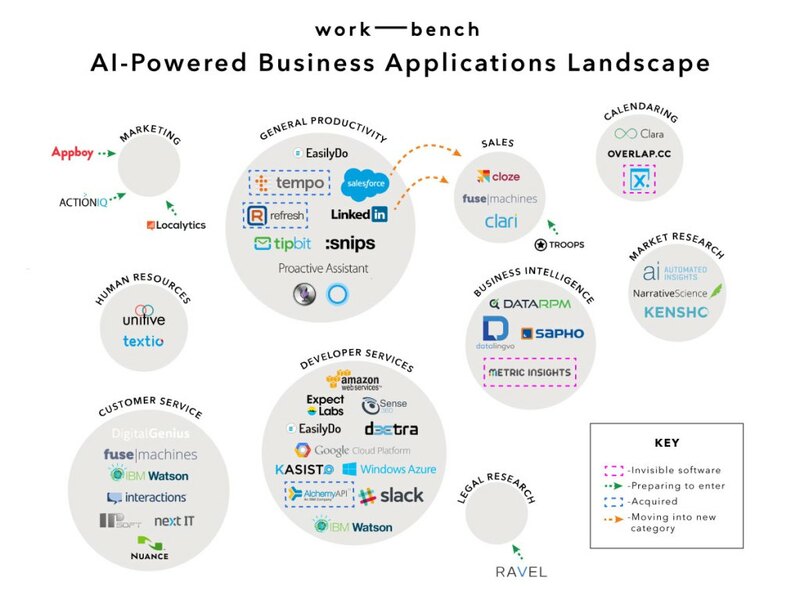 Kevin Kelly of Wired states it with spirit: “The business plans of the next 10,000 startups are easy to forecast: Take X and add AI.” Expect AI-powered business applications to spring up across enterprise software categories that touch the end user. Apps With The Most Abstracted User Experience Win The Title “Invisible Software.” In basic form, today’s AI-powered applications automate a single workflow, abstracting one point of engagement between the user and software interface. The underlying AI isn’t allowed to make further inferences as to what to do next without asking the user for approval. That’s about to change. AI-powered apps like Amy are evolving into UI-less “invisible software” that perform several consecutive steps in a larger business process without human intervention. Amy will not just schedule the date and time for a meeting, she’ll take a leap of logic and find an optimal place to meet (rather than bug you for your preference). This distinction is critical. By stringing the logic between individual ‘tasks,’ software begins to see the big picture and make decisions to serve a higher purpose. In consequence, time-on-screen shrinks and software is capable of just working in the background. “Invisible software” is the highest realization of the AI-powered app, likely to distinguish winners from losers within each category segment. It will also be the most disruptive because it automates a job rather than just a task. The Sales Assistant Is The Next Breakthrough AI-Powered App Category. Sales execs all speak to the “art of selling,” but many of the individual processes in sales are repeatable, predictable and ripe for AI automation. Imagine a service that takes the role of the entry-level sales development profession: identify leads on LinkedIn, send boilerplate emails asking for an introductory meeting, follow up (repeatedly), schedule the meeting, gather intel on the prospect and prepare notes for the sales director… rinse, repeat. It’s like Amy, but able to source leads and send along marketing collateral when prospects ask for more information. Enterprise giants are starting to catch wind of the opportunity. With its Refresh.io acquisition, LinkedIn is broadly interested in applying AI to sales processes. Similarly, Tempo.ai will likely recast its productivity assistant as a sales assistant post-Salesforce.com acquisition. How exactly this will manifest, we’ll have to wait and see. As startups flock into this space, and major software companies start placing bets, the effects will ripple across organizations. One breakthrough application at a time, human capital will start to shift from mundane tasks and transactions to higher-order, creative work. Along the way, we’ll see massive businesses built where software replaces or reshapes specific job functions. We’ll also see duds and false promises. I’m keeping a keen eye on carefully executed “invisible software” as the guiding light. Thanks to Brian Coulombe and Dennis R. Mortensen (x.ai), Jason Black (RRE), Tim Tuttle (Expect Labs), Eli Portnoy (Sense360), Sameer Maskey (Fusemachines), Jonathan Lehr and Vipin Chamakkala (Work-Bench) and Shivon Zillis (Bloomberg Beta) for sharing valuable feedback on the post and suggesting some companies I missed during my research. Special thanks to Brooklyn Coats for the chart. Kensho, Metric Insights, Ravel Law, and Tamr are Work-Bench Ventures portfolio companies. Kasisto, ActionIQ, Fusemachines, are members and/or alumni of Work-Bench’s enterprise technology community, but Work-Bench Ventures has no ownership in the companies. Michael is a former industry analyst turned VC who writes about artificial intelligence, security software, IoT, and structural changes in enterprise IT. At Work-Bench he focuses on investing in these areas and supporting our portfolio companies with GTM strategies and Fortune 500 customer introductions.